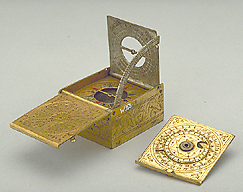 This compendium, engraved on the top with an unidentified coat-of-arms, opens to reveal a universal equinoctial dial and a finely enamelled wind rose. Unusually, the bottom leaf slides in a groove, to reveal underneath a silver plate engraved with the maker's signature. The nocturnal on the inner side of the sliding leaf has a folding handle.